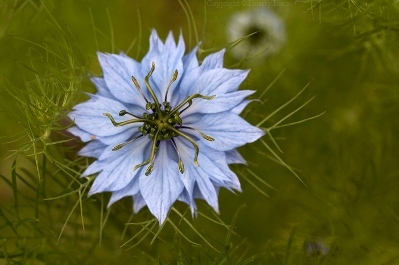 Nigella sativa is an annual herbaceous (nonwoody) flowering plant (angiosperm) that originated in the Mediterranean region but has been cultivated in other parts of the world such as Asia, Africa and the Arabian Peninsula. Black seed was originally discovered in the Egyptian Pharaoh Tutankhamen's tomb (dated about 1325 BC ). This is pretty significant because in the ancient Egyptian cultures only the highest of quality items were placed in the tomb in order to protect the spirit in the afterlife. Thus, Nigella sativa probably had an important role in the ancient Egyptian practices. It has also been mentioned in the Old Testament (Isaiah 28:27) and by the prophet Mohammed (Peace be upon him (Pbuh)) approximately fourteen hundred years ago! The prophet (Pbuh) said: "Use the Black Seed for indeed, it is a cure for every diseases", Sahih Bukari 7:591 except death". Nigella sativa is famous for its healing powers and is widely used as a medicinal herb (learn about its medicinal uses).The Greeks and Romans used Nigella sativa as a condiment and is still commonly used today as a culinary herb. Does N.sativa interact with other organisms? Nigella sativa benefits from a mutualistic relationship with fungi. 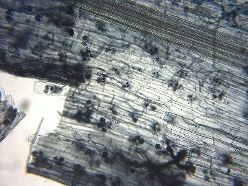 The fungi interact with the roots (endomycorrihazae) of the plant and sometimes within the actual plant cells. Nigella sativa benefits from gaining minerals from the fungi, especially Phosphorus, Nitrogen and Sulfur. And in turn the fungi receive glucose from the plant. The plant also offers protection for fungi against predators. Picture to the left shows an Arbuscular mycorrihza at the roots. Like any other plant, Nigella sativa are autotrophs which mean they can acquire their food (glucose) via photosynthesis by utilizing energy from sunlight. They are able to undergo photosynthesis because of a special pigment they contain on their leaves called chlorophyll . Nigella sativa is found in a lot of places; from the East Mediterranean to Northeast India. 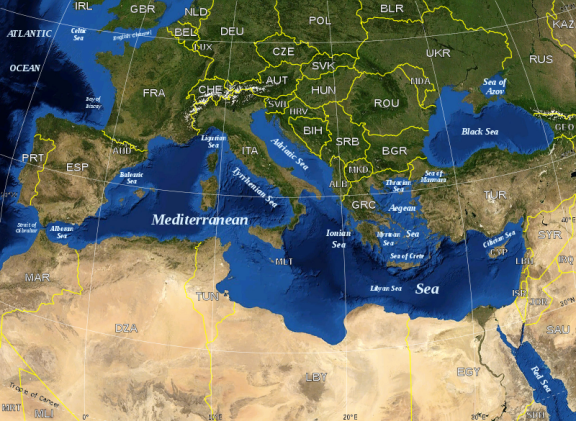 It is commonly cultivated in Egypt, the Middle East (Saudi Arabia in particular), Turkey, Sri Lanka, Kenya, Sudan, Afghanistan Europe and many more places.